Dacia has presented a new teaser announcing the debut of the new generation of Duster. The new SUV produced by the Romanian car manufacturer will be launched on September 12 at the Frankfurt Motor Show. The countdown until the debut of the new generation of Dacia Duster has begun, so the Romanian officials wanted to highlight this by presenting an interesting video teaser. 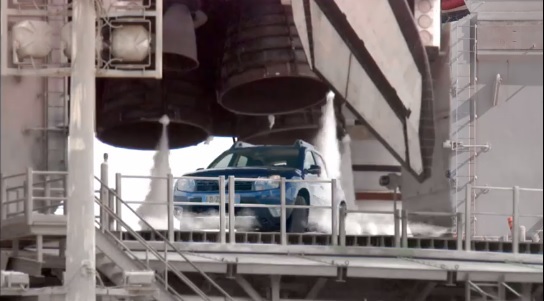 In this video, we can see a first generation Duster that hurries to get on time for the launch of a space shuttle. The second generation of Dacia Duster will be presented for the first time at the Frankfurt Motor Show that will open its doors for the journalists on September 12th. The new Duster was surprised during some tests and there is some information that it will have bigger dimensions, some minor aesthetic changes and a revised interior. At the same time, the passengers will also enjoy some more interior space. The Dacia officials have confirmed the production for the new generation of Duster will start at the end of this year. “The Mioveni factory is prepared for the production of the new Duster that will start by the end of the year. The new generation of Duster will be available for ordering on some markets in the first months of 2018, “said Yves Caracatzanis, president and general manager of Automobile Dacia. When will the new Duster be available for order in UK. Also what colours will it come in. Do you have an official release date for uk sales yet?